The Sabian 15007XBS HHX Super Set gives you an entire full, professional cymbal setup in one box. The HHX Super Set includes 14″ and 16″ Xplosion Crashes, 14″ Stage Hats, and a 20″ Stage Ride. For a limited time it includes a free 18″ Studio Crash and a free 10″ HHX Splash. If you're looking to completely overhaul your cymbal setup, these are a great pro-line choice. The pack price is really good for what you get. Take note that these cymbals are a bit more projecting than most HHX models -- the ride isn't quite as washy, the crashes aren't quite as subtle, and the hats are just a tad on the heavy side. If you're REALLY looking for that nice, dirty, dark jazz sound, I'd recommend Sabian Legacy cymbals or something from the Artisan Vault series. 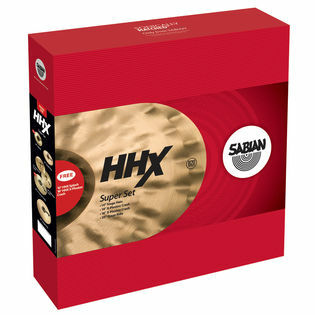 However, this is a beautiful cymbal set that fits just perfectly into jazz, fusion, and certain rock/funk applications particularly, and it's hard to find them at a better price.